Like a typical grandmother, Nguyen Thi Thi looks at her daughter and grandchildren with pride. As the family prepares a meal in their cramped kitchen in north-central Vietnam’s Quang Tri Province, Thi also looks on with feelings of regret. She knows she isn’t a typical grandmother. “Life has been hard for me and now it isn’t easy for them. I want them to have the opportunities I did not have,” says Thi. Her dreams of a family life full of opportunity were shattered one morning in 1975 when the farmland she was clearing erupted from a land mine left from the Vietnam War. The war ended that year, but the remnants still contaminate more than a third of the land in six central Vietnamese provinces. The explosion took Thi’s right leg and damaged her arms and eyesight. Facing a life on crutches with limited mobility, Thi became totally reliant on her elderly mother for her basic everyday needs. 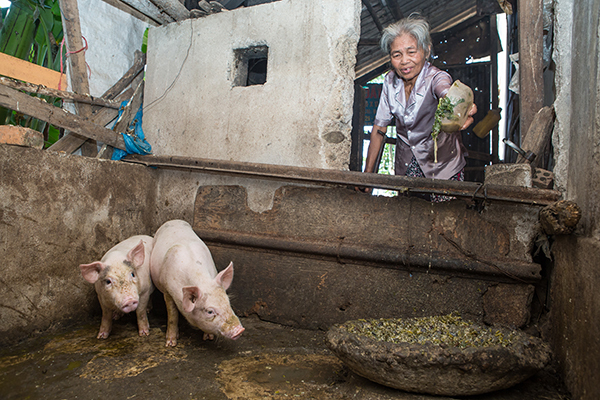 Once she married, her husband took on the primary caregiver role at their small farm in the Cam Lo district. Three of her four children died at a young age. Her husband also died. Alone, Thi was left to raise her youngest child, Nguyen Thi Nga. With little help from the neighbors and a small monthly disability allowance from the state, Thi struggled to care for Nga until she was old enough to tilt the balance of care towards her mother. This came at a considerable cost, with Nga forced to drop out of school in second grade to help raise chickens for the pair to survive. “We had no choice. We had to survive,” says Thi. The pair eked out a modest living with Nga later working a small rice crop and selling chilies at the local market. Nga bore two children during a brief, unsuccessful marriage. Then a Catholic Relief Services project, funded by the U.S. Department of State’s Office of Weapons Removal and Abatement, showed them that a better future is achievable. And Thi now believes they will be able to break the cycle of adversity that shaped their past. 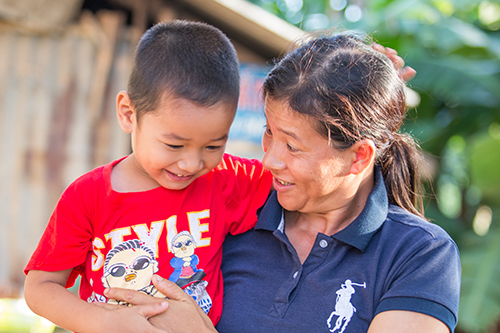 She and her daughter have an opportunity to create happy lives for Nga’s children, Trang and Kiet. The CRS project supported and rehabilitated ordnance and landmine survivors in central Quang Binh and Quang Tri provinces. In 2016, as part of the project, Thi and Nga were introduced to a community-based worker who quickly assessed the need for livelihood assistance and psychosocial support. The family first received $200 to purchase pigs. Raising pigs is less labor intensive than cultivating crops. The community worker also introduced them to the Women’s Union, which allowed them to take out a $45 loan to further help with their pigs. This support was backed-up by visits from the community worker. Like Thi and her family, hundreds of landmine survivors reached by CRS now realize a better quality of life is possible, and that they can become valuable contributors to their families and communities. Aside from livelihood assistance and financial support for medical treatment, the 24-month project—which closed in April 2017—also built a foundation to further develop the psychosocial aspects of care within communities. Today, 242 community workers and 2,060 family members of survivors have enhanced capacity to perform home-based care, and now know how to perform basic rehabilitation techniques and deliver psychosocial support. They reached 3,219 survivors by the project’s completion, complemented by 236 survivors who received in-depth medical examinations and treatments. The project’s low-cost and low-input approach to improve coordination among service providers, develop referral mechanisms and promote sustainability have been warmly acknowledged by local authorities. They now have greater awareness and a heightened receptivity to similar projects. The project has opened the door for CRS to continue work in the region to help people like Thi, and communities in need, improve their quality of life. In the case of Thi, this means seeing Trang and Kiet attend school and complete the education that was taken from Nga. “I have suffered, but Nga has worked so hard. We want a better life for the children,” says Thi.